Ford's specifications for lubricating the 1980 - 1986 light-duty trucks, including the locks, hinges, latches, speedometer cable, u-joints, suspension, linkages, engines, transmissions, and differentials for the F-series pickups and U-Series Broncos. However, since lubricant standards are always evolving it is sometimes difficult to find exactly what Ford specified. In fact, what Ford specified for use in the 1981 trucks is slightly different than what they specified for the 1985 trucks for exactly that reason. But, since in most cases the later standards are actually better than the earlier ones, the lubricants specified for the later trucks is fine to use on the earlier ones. Having said that, there are some specifications that have evolved to the point that the new ones tend to harm older equipment. In order to understand that go to the Evolving Specifications tab where I compare Ford's recommendations on the Recommended Lubricants tab with what you are likely to find on the shelf of your local auto parts store. (1) Add 4 ounces of EST-M2C118-A (friction modifier Part No. C8AZ-19B546-A) for complete refill of Traction-Lok or Limited Slip rear axles. But, the foregoing doesn't include the ZF5 transmission that is a popular swap into the 1980 - 1986 Ford trucks. 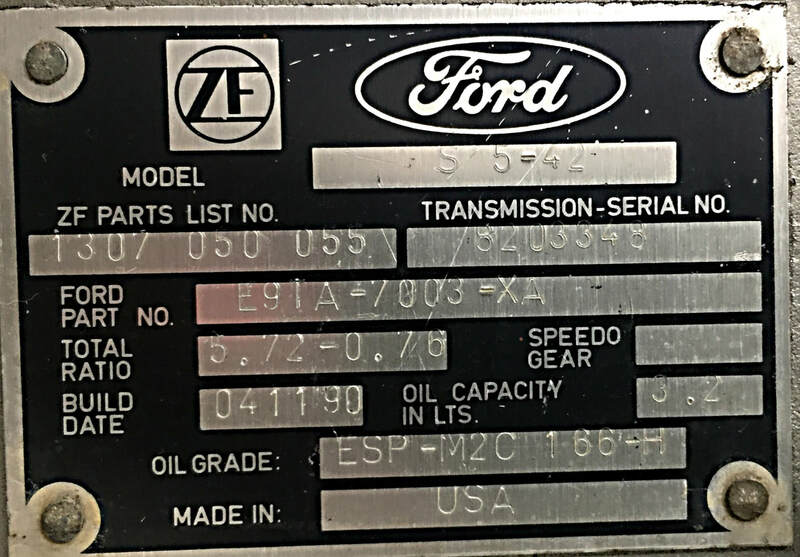 Here's the label from my ZF5, which shows that the lube should be ESP-M2C166-H.
ESP-M2C166-H: When introduced in 1981 this was known as Type H ATF, but was later called Mercon and was used as the standard Ford ATF until 2007 when Mercon V was introduced. Mercon V, aka Dexron III, superseded Type H and Mercon, but was itself replaced by Mercon SP in 2005, as explained by Hemmings. So, in theory, Mercon V or Mercon SP would be a good lube for a ZF5. But Royal Purple touts their Synchromax as the better lube for manual transmissions that call for Type H, as shown in the picture to the right, which was taken from Royal Purple's site here.